OMG! OMG! OMG! The Atone Phone is real! For several years, Stephen Colbert has done a bit on Comedy Central’s “The Colbert Report” with an “Atone Phone,” set up before Yom Kippur for him to receive apologies from Jews who have offended him. This week, I actually called it: 1-888-667-7539, i.e., 1-888-OOPS-JEW . I was stunned that (1) it rang, (2) there was a recording from Mr. Colbert, and (3) I had the opportunity to leave a message. So I did. I apologized for not believing the Atone Phone was real. Yes, dear readers, we are in the midst of the Ten Days of Penitence culminating in Yom Kippur, which begins Tuesday evening. Before that is a special Sabbath, Shabbat Shuvah (Sabbath of return or repentance). Shabbat Shuvah was also one of just two Sabbaths a year during which the rabbi gave a sermon (I can hear you sighing for the gold old days, both congregants and rabbis – especially the rabbis.) There’s a special haftarah on this theme, crafted from the writings of three prophets (two for Sephardim. No, I don’t know why. ): Hosea (14:2-10), Joel (2:15-27), and Micah (7:18-20), with minor variations. The verses from Micah are also read in connection with tashlich (casting bread/sins into flowing water) and after the book of Jonah on Yom Kippur afternoon. There’s no added Torah reading tomorrow, just Vayelekh, which is a mere 30 verses long. Moses tries to wrap things up, telling the Israelites. He about to die, but Joshua and the Lord will be there to lead them. He also writes down the Torah and instructs that it be read aloud in its entirety for the whole community, even children and resident non-Israelites, during the sabbatical year on Sukkot. Then, the Lord tells Moses that it is already certain that the people will screw up, worship other gods, forget Who is responsible for their prosperity, and consequently be punished severely. However, if they atone and mend their ways, will be forgiven, so the Torah reading actually does tie into Shabbat Shuvah and Yom Kippur. I am told that my brother, when he was about 5, announced that he did not like Yom Kippur because it was “a thinking holiday.” An apt description. Yes, it’s a fast day, but it’s a solemn, cleansing fast, not mournful. Remember that the people would be overjoyed when the High Priest came out of the Holy of Holies and announced that they’d been forgiven. In fact, upcoming nuptials would be announced at that time, which is why Leviticus 18:1-30, which is about forbidden sexual relationships, was chosen as the afternoon Torah reading. The morning Torah readings deal with the Yom Kippur activities of the High Priest (Leviticus 16:1-34) and, of course, the obligatory sacrifices (Numbers 29:7-11). The haftarah, Isaiah 57:14 – 58:14, teaches that it is not simply ritual per se that counts, but ritual that spurs social action, like taking care of the needy. 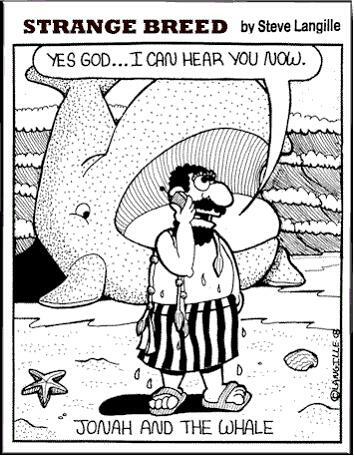 The afternoon haftarah is the book of Jonah (and the aforementioned verses from Micah), which can be read as a comedy routine (thanks for the reference, Stanley), a whale of a yarn (sorry), or a parable on duty and, especially, compassion and the universality of the Lord. That last is why we read Jonah as we near the end of the day. *It’s time to prepare for Shabbos-Rosh HaShanah-Shabbos Shuvah-Yom Kippur-Shabbos-Succos-Shabbos Chol haMoed-Shemini Atzeres-Simchas Torah-Shabbos. *Boards and committees are starting up their meetings and their work. *Your children are going back to school and will need homework help and carpool. 10. Hands tremble when people mention Rosh HaShanah, or October, even in casual conversation. Or when he sees a shofar, or even a lemon. Or when he sees a child throwing bread to fish in a stream. 9. Found loitering outside a travel agency, staring wistfully at the posters. Alternatively, gets a dark look and begins to growl when you start describing your vacation. Says loudly, “I’m glad someone got to go away!” – and he’s not smiling. 7. Begins delivering daily post-davening d’var torah from books on death and mourning. 5. Drains entire kiddush cup of wine, then declares he mispronounced a word and needs to say it again. And again. 3. Leans for tachanun* at Shacharit [morning service], doesn’t come back up until Minchah [afternoon service]. 1. Includes self among the names in the Mi sheBeirach (prayer for the sick). Or in a Kel Malei Rachamim (memorial prayer). As far as advice for burning-out rabbis, my best advice comes from Rabbi Dr. Avraham Twerski: Always make sure you have another means of parnassah [earning a living] That, and this: Always keep your sense of humor. If you don’t have one, get one. Inspiration From On High: Rabbis met with Hollywood scriptwriters as they sought to create punchier sermons for the High Holy Days. Comedy writer Janet Leahy was working on an episode of “The Simpsons” a couple of years ago, when her rabbi asked her for three jokes to punch up his Rosh Hashanah sermon. With this year’s High Holy Days looming, Leahy sat on the sun-drenched terrace of the Stephen S. Wise Temple and listened attentively to two other rabbis pitching ideas for their biggest sermons of the year. In Jewish learning, this kind of give-and-take is similar to havrutah, a session in which everyone shares ideas. In Hollywood, it’s called the Writers Room, a fast-paced process where scriptwriters sit around a table and trade ideas under tight deadlines and the pressure to turn out hit shows. Put the two together, and you get the High Holy Days Seminar, the largest trans-denominational gathering of rabbis on the West Coast. Presented by the Board of Rabbis of Southern California, under the aegis of the Jewish Federation of Greater Los Angeles. “Rabbis want to be on the cutting edge,” said seminar chair Rabbi Jon Hanish, who organized the Professional Writers Workshop for the August 16 seminar. Having dabbled in the movie business, Hanish attended the University of Southern California’s film school, sold a few screenplays and ran a postproduction facility before deciding to deliver sermons instead of pitching scripts. “My screenwriting classes taught me more about writing sermons than rabbinical school,” he said. It was Hanish who had solicited jokes from Leahy, and by drawing on his industry ties pulled together a slew of star writers for the workshop. The impressive roster included Leahy and colleague Lisa Albert, both writers for The AMC series “Mad Men”; Emmy- and Golden Globe-winning television writer/producer David M. Israel of Nickelodeon’s new series “How To Rock,” and Jason Katims (NBC’S “Parenthood” and “Friday Night Lights,” Fox’s “Boston Public”). In one session, a rabbi asked if it was possible to make his sermons more personal with examples from real life without making his congregants uncomfortable. “People come to me for counseling,” he said, “but they don’t want to wind up in a sermon.” The writer nodded sympathetically, but it looked like he was tucking away that idea away for a future episode. “How do you like the ending?” another rabbi asked writer Dahvi Waller after she had perused a draft of the rabbi’s sermon. Waller, a veteran of ABC’S “Desperate Housewives,” liked the first draft for earning what TV writers dub “The vomit pass — where we just get it all out there.” Still, she said the sermon needed fewer generalities and more details. “What makes writing fresh is finding specificity,” Waller told the rabbi. The session ran well over its allotted hour, and the writers exchanged e-mail addresses with the rabbis, promising to help them with jokes and rewrites. Hanish seemed pleased. “We’re piloting this program,” he said, indicating that if it was picked up next year, it would probably go through a few rewrites. 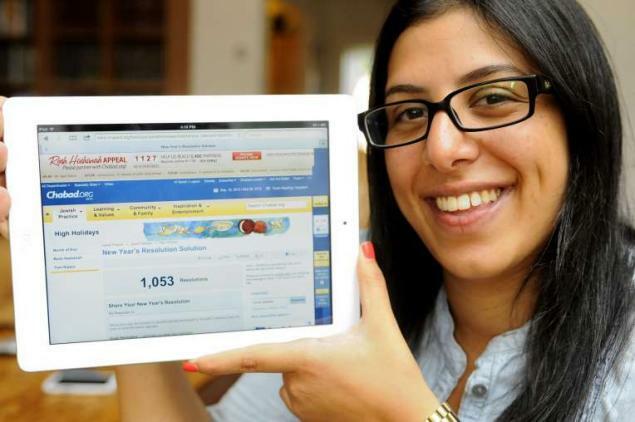 Rinat Badash, of Marine Park, shows off a Rosh Hashana web tool “Resolution Solution” which allows users to enter their Jewish New Year’s resolutions, then sends them reminder emails. A little nagging’s not so bad – if it’s electronic. That’s the idea behind a new email-alert service a group of Crown Heights rabbis devised to prod people to keep their Jewish New Year’s resolutions. “[It] can nag you once a day. It can nag you weekly, monthly, but it rests on Shabbat,” Rabbi Motti Seligson, 30, said of the Resolution Solution, which he created with a team of tech-savvy rabbis. since it hit cyberspace last week, posting New Year’s promises on a public message board that lets them choose how often they want the bossy reminders to hit their inboxes. Daniel Nottes, 28, signed up last week, asking for frequent reminders about his resolution to use his gym membership four times a week. “It’s like a virtual Jewish mother,” the Upper West Side lawyer said. “Jewish mothers aren’t annoying. They are persistent. They keep you in check.” The emails show up just when he gets off work — and so far, so good: “I’m going to the gym,” he said. On Yom Kippur, the Jewish Day of Atonement, we need to search our hearts and recognize our wrongs (the hardest part! ), then do all we can to make amends to those we have wronged, and ask their forgiveness. We then go to services and communally pray, asking the Higher Power for insight, strength, and forgiveness.